Thanks for viewing our Spring 2017 Newsletter! We hope you enjoy this brief look at some of our achievements and activities. Many of you have received our 2017 Conquest magazine by now. This year’s layperson-friendly stories showcase Dr. Ryan Rafferty’s work to modify cancer drugs so they can both penetrate the blood-brain barrier and be less toxic, Dr. Nick Wallace’s efforts to combat human papillomavirus-caused cancers, and student researcher Raquel Ortega’s work on a cancer early-detection test. 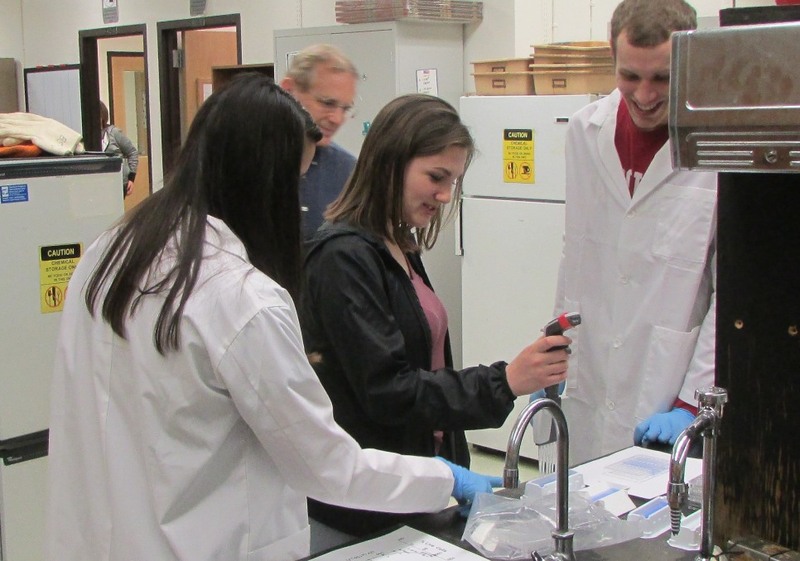 Also featured is the “lab-on-a-chip” early-detection test being developed by two chemistry professors and supported by actor and K-State alum Eric Stonestreet. 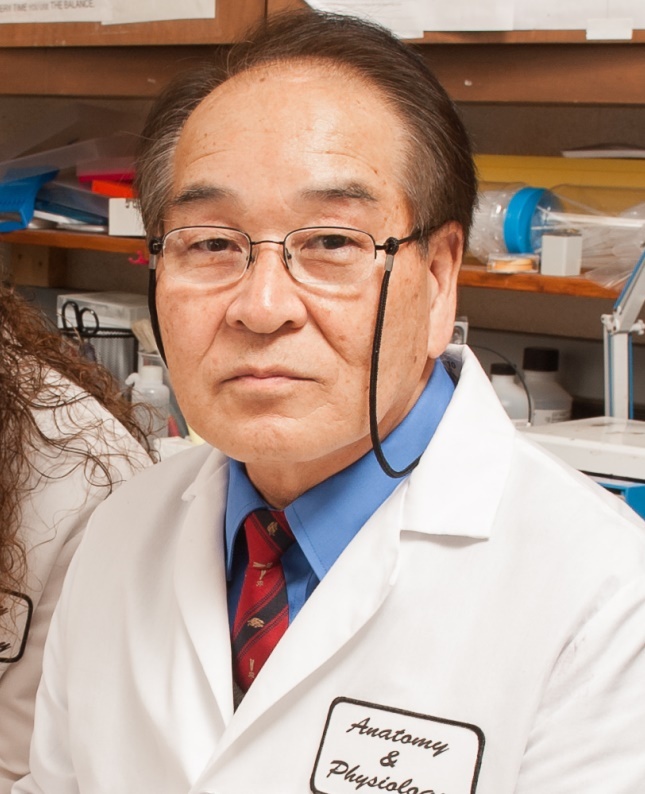 We also look back at the career of our past director Dr. Rob Denell, who retired last fall, and at our 15th Bascom Lecture delivered by a renowned HPV expert. We invite you to read Conquest online or request a paper copy. We greatly appreciate the many responses we’ve received and hope to still hear from some of you. Please email us if you should have, but did not, receive a survey. K-State Head Football Coach Bill Snyder, a member of the Johnson Cancer Research Center’s advisory council, announced Feb. 13 that he was being treated for throat cancer. His prognosis was excellent and he completed treatment in time for spring practice. Since Coach’s announcement, many people have made donations in honor of him and purchased our Fighting for a Cure shirts. We are so grateful to the K-State Family for showing their support in this meaningful way. As is our protocol, we will notify Coach Snyder of every donation made in his honor. Many fans plan to wear their Fighting for a Cure shirts to the Purple/White Spring Game April 22 in honor of Coach Snyder. We have shirts in stock and they are $20 each. Learn more on our website. 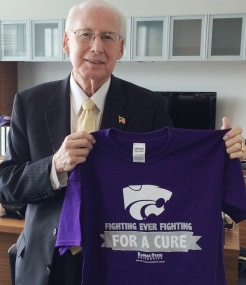 Many friends will also wear their shirts to the home football game and elsewhere Oct. 14 for the 4th Annual K-State Fighting for a Cure Day, when the Marching Band will do a special tribute and we’ll have a tailgate party. Sat., April 22 – 8 a.m. The Race to Save 2nd Base, presented by Downtown Manhattan, Inc., will feature a 5K run along Poyntz Ave., beginning and ending at AJ’s Pizzeria. Finishers will get a medal, pizza and a beer for their effort. Attractions include the K-State Marching Band, Willie the Wildcat, a bounce house and obstacle course for the kids and free cancer screenings. A portion of proceeds will support our center. Learn more and register. Sat., May 6 – 9 a.m. The statewide fitness initiative, Walk Kansas, which is organized by K-State Research & Extension, will hold its 2nd Annual Walk Kansas 5K for the Fight, 1.5-Mile Fun Walk and 50-yard Kids’ Fun Run on the K-State Manhattan campus May 6. Proceeds will support our center! All participants receive a race t-shirt, snacks and more. Place finishers receive custom medals. This is open to everyone, not just Walk Kansas program participants. Learn more and register. See more upcoming events on our website. Congratulations to our 2016-17 Undergraduate Cancer Researchers! 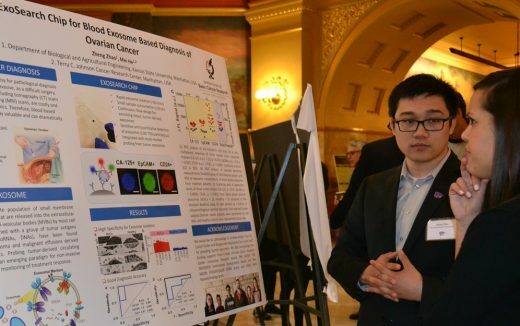 Forty-six students were selected for our Cancer Research Award (CRA) program, which offers faculty-mentored research experiences and $1,000 awards for up to 50 undergraduate students per year, plus $1,000 per student to cover research expenses. This year’s recipients are listed on our Student Awardees webpage and in this news release. They and their faculty mentors will be recognized, along with the donors who make the program possible, at our annual CRA Banquet April 21. Photos of the banquet and each student receiving his or her award will be shared after the event. Watch our Facebook and Twitter pages. 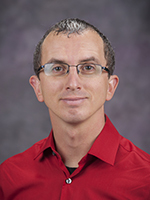 Dr. Nick Wallace, biology, received a Department of Defense Peer Reviewed Cancer Research Program‘s Career Development Award for $360,000 over three years. 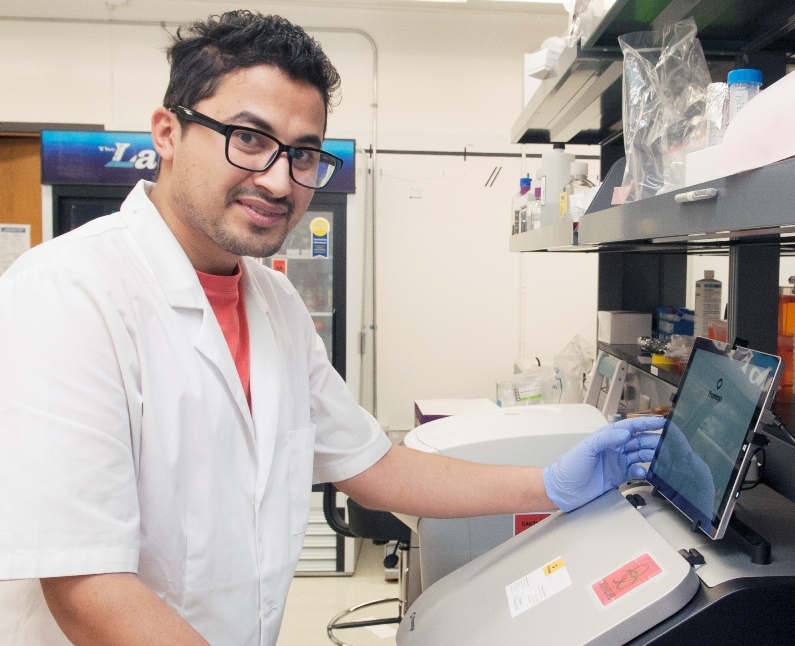 He studies human papillomavirus, a cancer-causing virus. 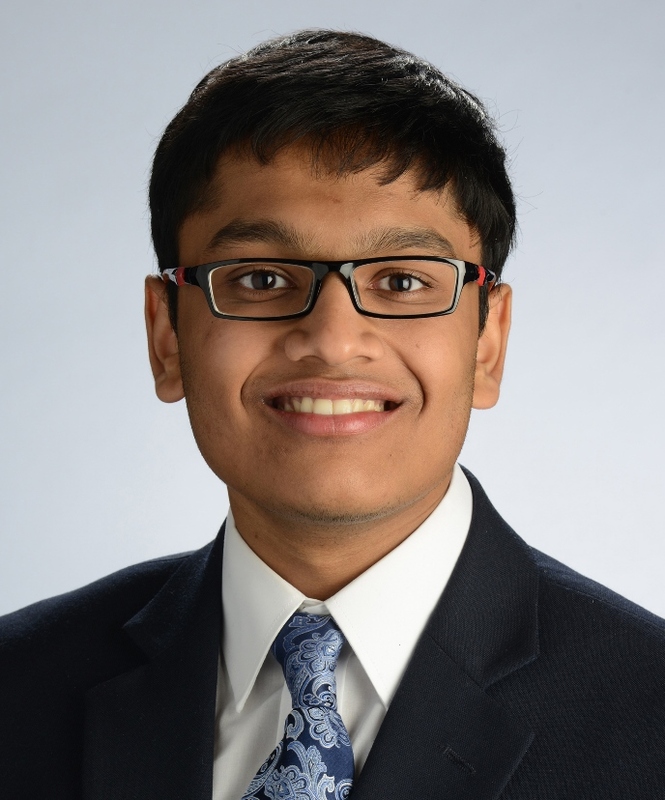 Vaithish Velazhahan, junior in biology working with Dr. Kathrin Schrick, was named a Goldwater Scholar. 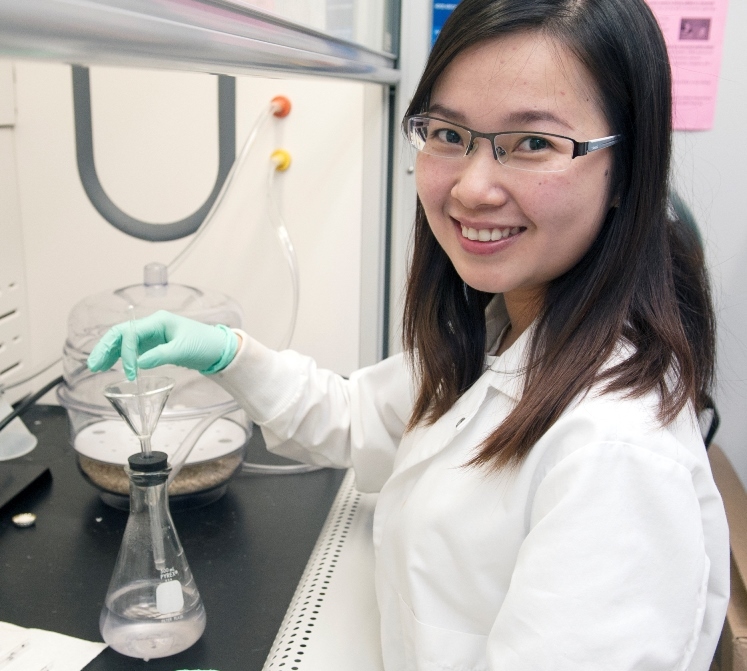 The award recognizes excellent undergraduate students who have active research projects and plan to pursue careers in mathematics, science or engineering. 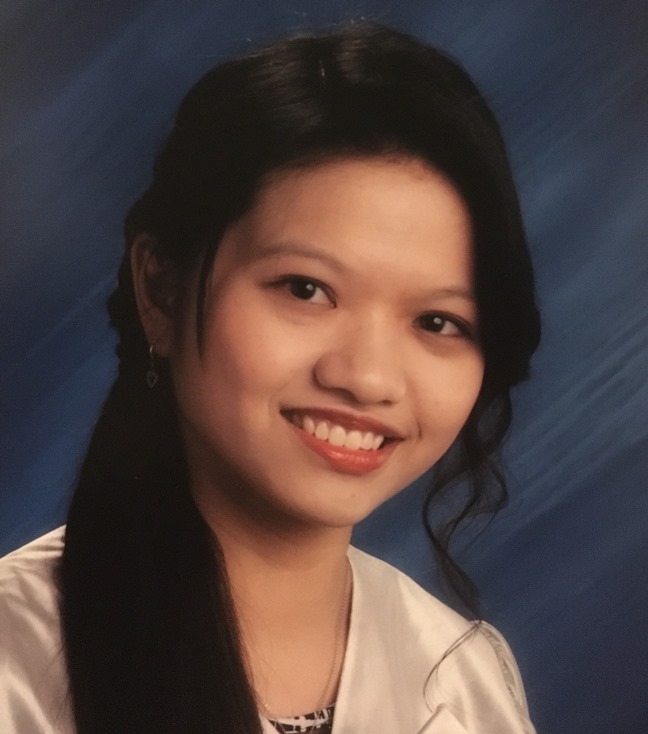 Kathlyn Gomendoza, junior in biology working with Dr. Lorena Passarelli, received a Goldwater Honorable Mention. The award recognizes excellent undergraduate students who have active research projects and plan to pursue careers in mathematics, science or engineering. 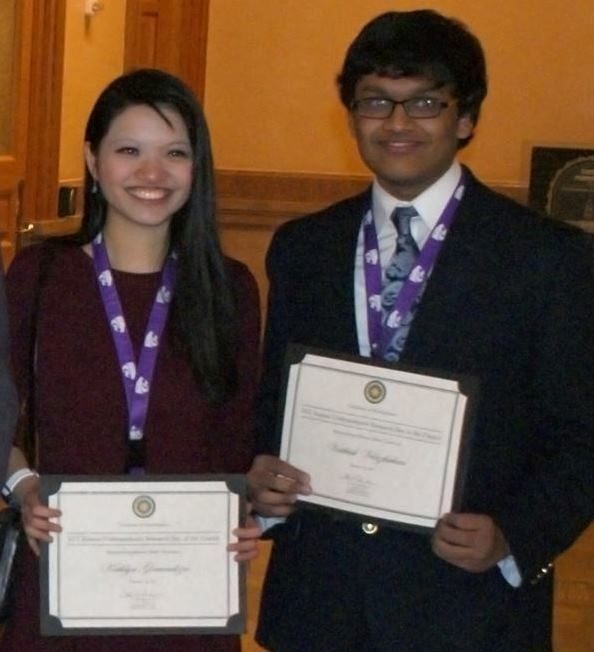 Velazhahan and Gomendoza also presented their research at Undergraduate Research Day at the Capitol Feb. 15. We had a great time welcoming guests at K-State Open House Sat., April 1. After hearing a bit about K-State cancer research and the Johnson Cancer Research Center, guests were taken to see Dr. Nick Wallace’s laboratory in biology. Big thanks to Dr. Wallace and his team for partnering with us this year, and to our helpful volunteers Justin Walker and Johnathan Dallman, both undergraduate cancer researchers! Thanks also to all the visitors who took an interest in our center! We welcome school and community groups to visit our center. 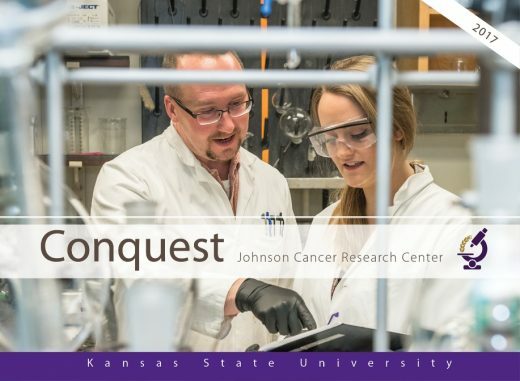 After a brief discussion about cancer research and education at K-State, visitors are taken to see a Johnson Cancer Research Center affiliated laboratory. 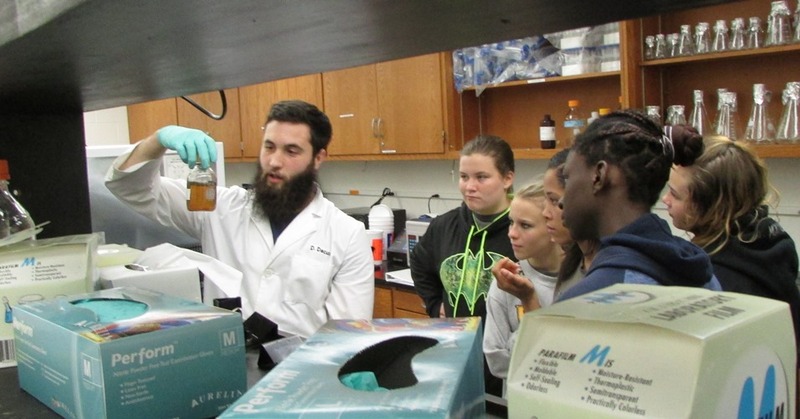 Pictured here are Lawrence middle school students visiting Dr. Wallace’s lab in biology. On occasion, we are invited to present to community groups. We appreciate the opportunity to inform people about the excellent cancer research happening at K-State and how our center supports it. Here, our communications & outreach coordinator Marcia Locke visits with the Health Ministry group of First Lutheran Church of Manhattan in February. 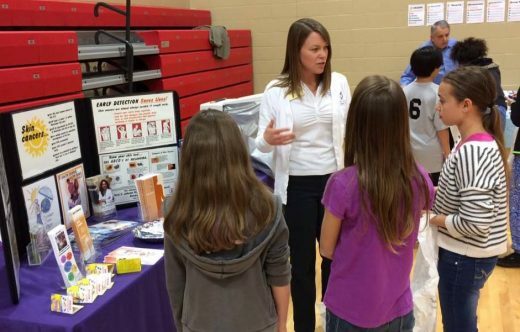 We look forward once again to visiting the Fort Riley Middle School Wellness Fair April 28. We’ll inform the students about potentially cancer-causing skin damage caused by ultraviolet radiation from the sun and tanning beds, and how to reduce their risk. Some will get to see early signs of damage on their own skin using a DermaScan on loan from Midwest Cancer Alliance. Skin damage that can lead to cancer later in life starts in childhood, when more time is spent playing outdoors. To schedule a visit at your location or ours, please contact us at cancerresearch@k-state.edu or 785-532-6705.